Why frozen embryo transfers are better than fresh IVF cycles. In the past, it was believed that the chances of getting pregnant were better when we transferred fresh embryos in an IVF cycle. After all, the word " fresh " itself suggests that these are vital , viable embryos, which are much more likely to implant, as compared to frozen embryos. Patients would confuse the quality of frozen embryos with the quality of frozen vegetables and fruits kept in the refrigerator. This is why they would believe that these were stale, or not as healthy as fresh embryos. In fact, this was true in the past, when we used slow freezing in order to cryopreserve embryos. 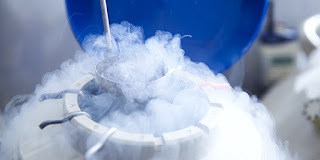 The technology for freezing embryos wasn't very good, as a result of which a lot of these embryos would die as a result of freezing and thawing them. 1.The endometrial receptivity is much better in a frozen cycle, because we can prepare the uterine lining optimally . In a fresh IVF cycle, the high dose of hormones used for superovulation can impair endometrial receptivity. 4. The frozen thaw transfer cycle is much easier and less stressful, because there are no injections, and you just need to come to the clinic for 2 -3 scans !